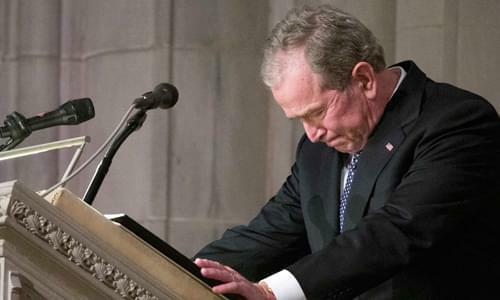 On Wednesday’s Mark Levin Show, President George W. Bush, beautifully eulogized his father President George H.W. Bush. Also, the new attack on President Trump from the Attorney’s General of Maryland and Washington, D.C. are based on Article 1 section 9 of the Emoluments Clause which clearly states that Trump cannot accept a title of Nobility or be employed by a foreign government. Upon winning the presidency President Elect Trump relinquished operational control of his business to his sons and put his interest in a trust. The Emoluments clause has nothing to do with foreign dignitaries staying at hotels he owns but does not operate. Yet, that hasn’t stopped the subpoenas from being issued. They also charge that Trump’s hotel may also be negatively affecting other DC hotels because of its affiliation with the president. This is bogus and is a perversion of the Emoluments Clause. Then, Lt. Gen. Michael Flynn has been reckoned a sentence that does not include jail time. Some in the media are erroneously speculating that indictments of Donald Trump Jr. and Jared Kushner are to follow but none of that is factually stated in the 13 page filing from the Special Counsel. Frederic Bastiat’s book, The Law, asserts that life liberty and property are the three fundamental rights required for a free society. What we’re seeing with the Mueller investigation is the law going beyond protection of the person, liberty, and property. This perversion of the law has been achieved by stupid greed and false philanthropy according Bastiat. The lawyers, the politician, and the media are doing the same thing today because they don’t like the man who was elected president and they”ll achieve it by changing the constitution or its application. Power, manipulation, and positioning are the fatal tendency of mankind and the republic is the victim!